If you were presented with a lineup of wine and had to pick only one, could you do it? Are you influenced by certain factors such as grape variety, producer, region or country, price or points scored? Is there a particular reason why you drink what you drink? This has been on my mind as of late, and just for fun, I’ve put together a couple of lineups of products to see what the wine of choice would be and why. I recently had a conversation with a friend of mine with whom I took Diploma with, and we were discussing Champagne. He was singing the praises of (most) Champagne and telling me how much he loved it, and could very easily consume it daily. I on the other hand, would never choose it as my first choice in drink. There would always be something that comes before Champagne. In fact, it would likely be my last choice in a lineup of wine. That being said, those that offer me Champagne, I’m highly unlikely to refuse! Are you likely to choose Champagne? What about an aged Bordeaux? If you like French, why not some classic white Bordeaux or a Condrieu? Italy is strong with their Super Tuscans, or a Barolo even? Nothing like a good Napa or Sonoma Cabernet Sauvignon right? 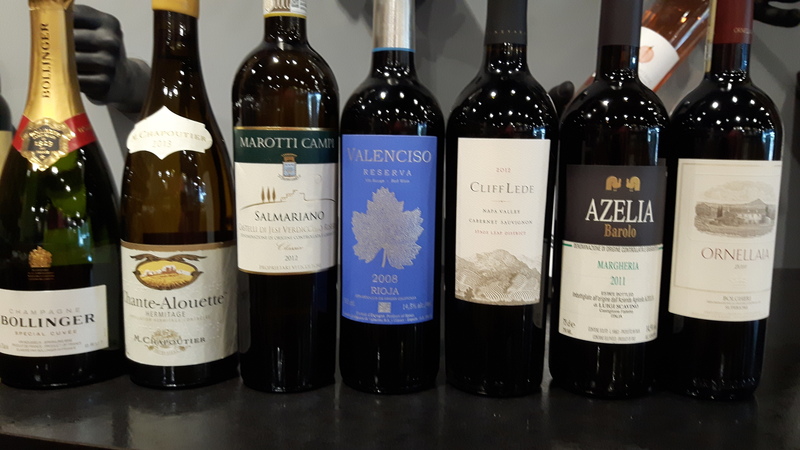 How about some of the more innocuous wines like Verdicchio, or 100% Marsanne from a well known producer in Hermitage? Or perhaps you prefer one of the Rioja Tempranillos with a Reserva or Gran Reserva label on it? Are you more of a geek and prefer something different like a Brachetto or Nerello Mascalese? Put your thinking caps on if you can, please give me your choice and why. Everyone has that special “niche” in their palate, and I know what I would choose in these lineups, so I’m wondering…what would YOU choose? Hmm, this lineup might look a lot like the first one. Same Champagne, a Barolo, Napa Cab, a Super Tuscan…but I’ve thrown in a couple of new ones. Would you choose the same bottle? If you chose Champagne the first time, would you choose it yet again? I have another lineup to show to you, but will wait until Friday to post. There’s some cool, geeky stuff in there, and for those that have perhaps tasted any of it, I wonder how you will choose from this lineup! Salute! 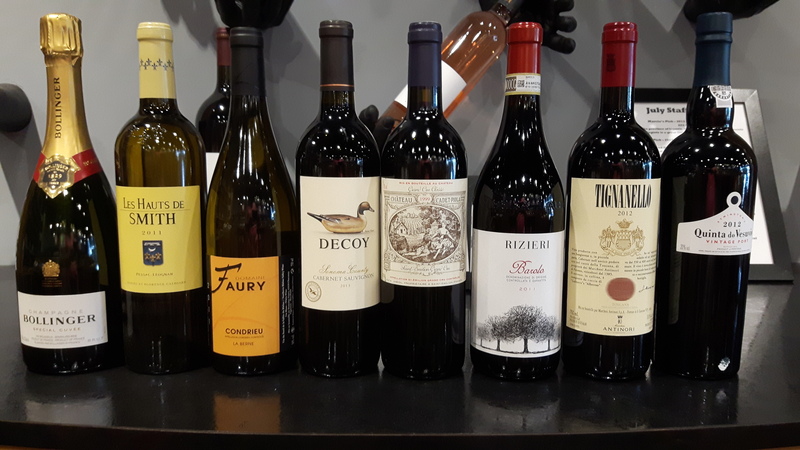 This entry was posted in Education, Tasting, Varietals, wine and tagged Alba, Barolo, Bourdeaux, Cabernet Franc, Cabernet Sauvignon, Champagne, Chapoutier, Chardonnay, choice, Condrieu, France, Italy, La Morra, lineup, Marche, Marsanne, Merlot, Napa, Nebbiolo, Northern Rhone, Petit Verdot, Piedmont, Pinot Noir, Port, Portugal, Quinta, Reserva, Rioja, St. Emilion, Stags Leap, Super Tuscan, Symington, tempranillo, Tuscany, Verdicchio, Vesuvio, Viognier. Bookmark the permalink. 11 Responses to What’s YOUR favourite? From your first group I think that I would go with the Faury and with the second group I would go with Chapoutier. In the heat of the summer, either or both of them would fit the bill perfectly. Tough decisions and a nice selection. I agree with those selections! Both fabulous wines! I love Champagne. But really just couldn’t choose one favorite. Too much great wine in the world! *are typically as tough as nails! Lately I have been enjoying NZ Sauvignon Blancs. But I could also go for any lineup of Big Bold Reds. So the American Cabs might suit you? They certainly do. At least most of the time. There are some that aren’t bold enough for my taste and palate. Or perhaps the Barolos? If you want that tannic burst maybe? Good idea. Barolos haven’t been on my radar lately. Maybe when the weather cools down a bit I’ll buy another bottle. And totally ageable! The Serralungas are not typically as tough as nails so need time but La Morra and Barolo can be drunk much earlier and are really pretty and delightful to drink! Thanks for your comments!